Jack calling Mac, saying he has to see her. Caleb and Summer going to his parents' restaurant. Steph trying unsuccessfully to stop Jack from seeing Mac. Steph tells Max what happened. He tries to stop her from going after him, but she does anyway. Summer, who was previously told to go to bed, tries to discuss Caleb with Max, but he won't hear of it. Jack meets up with Mac in the pub. She comes out of the toilets (or from that direction) and hands him back his credit card. They talk about their plans for the night, and suddenly Jack kisses her, because he has to hide from Steph, who has suddenly entered the pub looking for him. Jack explains what happened and that Steph his trying to save him from himself. Mac says she should get a life, and Jack gets testy. Mac quickly says she was only joking, and the two of them leave. Max has been waiting up for Steph, who returns without finding Jack. Steph doesn't know what she'll tell her parents, and she hates keeping stuff from them. She reminisces on a time when she would be always breaking rules, and Jack would run after her telling her to be careful. She starts blaming herself, and Max tells her not to, he isn't doing anything because of her. Max suggests they go to bed, and see how it looks in the morning. Lil gets up and walks into the kitchen. She finds that David has surprised her with an ancient sewing machine. Jack leaves, with Mac running after him asking him to come back. He tells her to forget it; she's ruining his life, and also his family's lives. She tries to get him to come back (“I've got something that will make you feel better”), but Jack tells her to go away, and he has to be at work in half an hour, after another night with absolutely no sleep. After some more arguing, where Jack blames Mac for ruining his life, he drives off. Harold adds, “and there's none of that whizz-bang electronic computer stuff to go wrong.” Lil manages to convince Harold and David that she likes it. A tired Jack is driving home to get ready for work. Mac calls his mobile and he answers it while still driving. Suddenly a van pulls out without looking, forcing Jack to swerve off the road and crash into a pole. Meanwhile, in the Bishop house, Lil starts the sewing machine when suddenly it blows up and the power in the house goes off. Jack's car is completely wrecked, and Jack is slumped forward, head on the steering wheel. Meanwhile, passers-by come to help, while Mac keeps calling out Jack's name over the phone. The police and ambulance come. 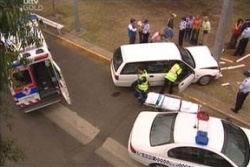 Police chase off the people, medics get to Jack. Summer tells Max the TV isn't working. Max tells her he'll sort it out tonight, but she has to get ready for school. The two of them then discover that none of the appliances work, and Summer tells him she shouldn't go to school, because if the power's out, they won't be doing any work anyway. Summer tries a different approach: the truth. She tells him that it's Caleb's last day in town. This definitely doesn't work with Max, and he tells her to get a move on. While they argue, Steph come in and tells Max that Jack still hasn't come home. The three of them leave, Max giving Steph a lift to look for Jack. 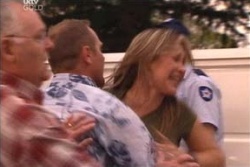 Mac sees the accident, and uses her job as a police officer to get to the crash. When no one's looking, she reaches in and takes Jack's phone out of the car, to hide any evidence of her call with him. The adults survey the damage. Most of the appliances are wrecked. Lil blames the sewing machine for the damage. David gets offended, and Lil tells him it was a nice thought. David phones the electrician, but there's no answer. Harold goes for a walk to see if anyone else's power is out. As luck would have it, the kids do have no classes, and are all standing around in the corridors. Summer tells Lisa about Caleb, but she doesn't believe her. Suddenly Caleb comes down the corridor on a scooter, and he picks up Summer. She introduces him to Lisa. “This is Caleb, my imaginary boyfriend, and this is Lisa, my ex-best friend.” She leaves with Caleb, and Lisa still can't believe what she just saw. Harold walks by just as Max and Steph pull up. While Max and Harold talk about the accident and the blackout, Steph notices the car, and recognises the number plate as Lyn's car. She runs towards it, Max coming after to calm her down. Summer and Caleb get back from a day of fun. Caleb asks if Summer could come back to visit him, which of course is out of the question. They wish they lived closer together. Suddenly the power comes back on, with many groans of students. Lisa comes over to flirt with Caleb, who instantly shoots her down (not literally). Caleb says goodbye, and gives Summer a friendship ring. He promises he'll come back another time. Steph is beginning to freak out. The doctors won't tell her what's happening. Max tells her he'll be alright. Steph says she doesn't want to tell Joe and Lyn until she knows something positive. 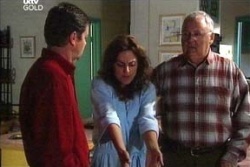 Max relates Jack's experience with Boyd's, when he stole Toadie's car and crashed it. Steph says it's different, because Boyd wasn't on drugs, but Max says he was in just as much trouble as Jack's been in. Max says her parents deserve to know. Steph says she'll tell them, but right now she wants to know that Jack's fine. Harold is on the phone, finding out about Jack, but still no one knows anything. David says it's especially bad, what with Jack struggling to run the business with no qualifications. Harold says that no one knows how the accident happened. David says it's unfair. There's Jack fighting for his life, while the drunken hoons of the world get away without a scratch. Harold tells David and Lil abut Steph's decision to not let Joe and Lyn know yet, and asks them to not say anything. Meanwhile, Summer is sitting down having a milkshake, and Lisa sits down, trying to work her way back onto Summer's good side. She asks about Summer's ring and Summer tells her that Caleb gave it to her. Lisa asks if they can be friends again, and Summer says she's not sure if she wants to. She'll have to wait and see. Steph and Max are finally allowed in to see Jack. Steph tells Jack that he has a ruptured spleen and some broken ribs, and he has to take it easy. Steph asks Jack if he remembered what happened, and the scene replays in Jack's mind. He shakes his head in answer to the question. Jack tells Steph that he saw her at the pub the night before, but he hid from her. He gets worked up, and begins a coughing fit. While Steph helps him out, Max goes looking for a doctor.